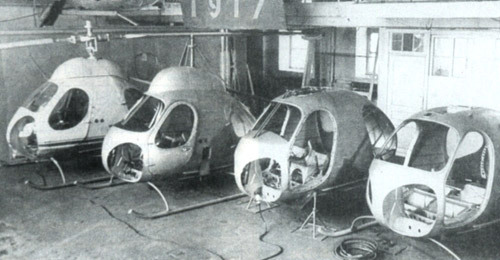 The Mil V-7 was an unusual experimental four-seat helicopter with AI-7 ramjets at the tips of the two rotor blades. It had an egg-shaped fuselage, skid undercarriage, and a two-bladed tail rotor on a short tubular tail boom. Four aircraft were built in the late 1950s, but only one is known to have flown, with only the pilot aboard. Wikimedia Commons has media related to Mil V-7. ^ "no title". aviastar.org. Retrieved 15 October 2015. ^ Simpson, R.W. (1998). Airlife's helicopters and rotorcraft. Shrewsbury: Airlife. ISBN 978-1853109683. ^ a b Gunston, Bill (1995). The Osprey Encyclopaedia of Russian Aircraft 1875–1995. London: Osprey. p. 235. ISBN 1-85532-405-9. This page was last edited on 19 May 2018, at 02:35 (UTC).